Later today, Bottleneck Gallery will be releasing this epic DC Comics screen print “Year One” by Raid71 (Chris Thornley). What a beautiful tribute to the seminal Frank Miller and David Mazzucchelli comic book storyline, Batman: Year One, which formed the modern foundation of the Batman mythos we know today. This strikingly grounded take on Batman and James Gordon’s first year fighting crime in Gotham still holds up as a classic comic book story. As BNG explained, “Raid utilizes some of the coloring and lighting from the original comic books, and does a great job of evoking the feel of Miller/Mazzucchelli’s story. 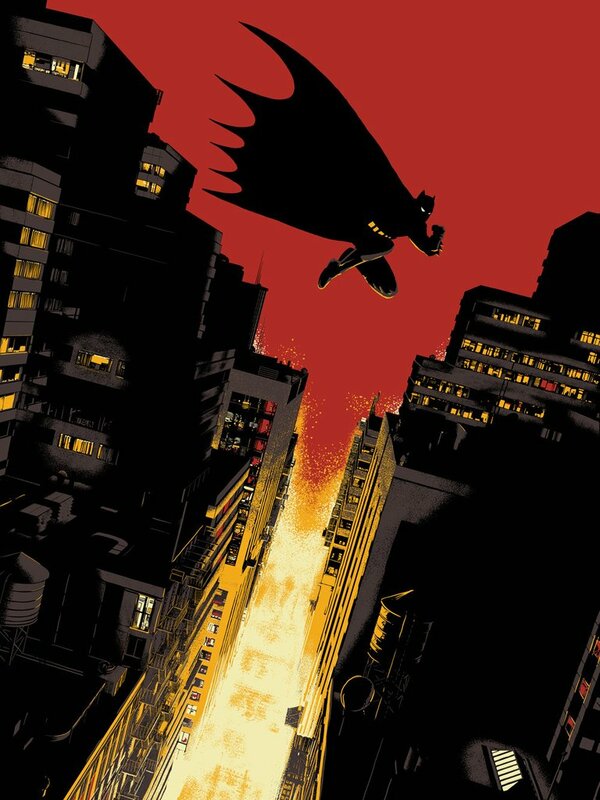 We’re thrilled with how well Raid executed this print idea.” Batman: Year One by Raid71 is an 18”x24” hand numbered DC Comics screen print. Limited to just 100 pieces, this print will go on sale at 12pm EST today, Tuesday, April 25th, at the Bottleneck Gallery online store for $45.